"Enlightenment is found within the darkest of hours"
Detroit, MI - On October 25th through 27th 2018 at the Tangent Gallery/Hastings St Ballroom in Detroit comes an extraordinary assemblage of 125 artists from across this world to display 150 of their most introspective creations at the 11th Annual DAMNED Exhibition of Enlightened Darkness. From the infamous to the freshest of local and international talent, this prodigious congregation will allow us a glimpse within the diverse shadows of id and ego…of overall mind and encompassing soul guaranteed to intrigue, disturb, inspire or repulse. Rising from within the ashes of Detroit’s historic institution of Devil’s Night, this is not Halloween-themed art but an immersion within the immeasurable realms of consciousness through an elegant ambiance of live ethereal music and cirque/butoh-inspired performances. 10/25 “The Darkness” – A night of introspective exploration within the shadowed and primal essence of self. 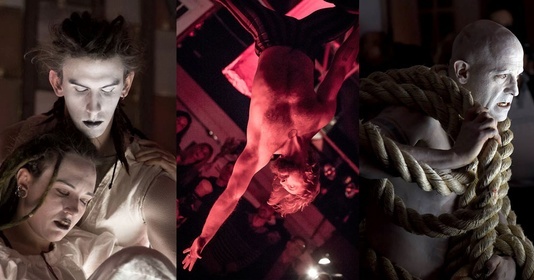 This opening night features an intimate VIP Preview/Artist Reception, an absinthe tasting courtesy of Two James, an on-site chef preparing hot hors d’œuvres and experimental aerial and butoh-inspired performances. 10/26 “The Enlightenment“ – A night of the extrospective self enlightened through light, fire and the ethereal. This gala night features an on-site chef preparing a sampling of internationally-inspired tapas with flavored mead tasting courtesy of B Nektar Meadery and exotic fire, aerial and experimental performances. 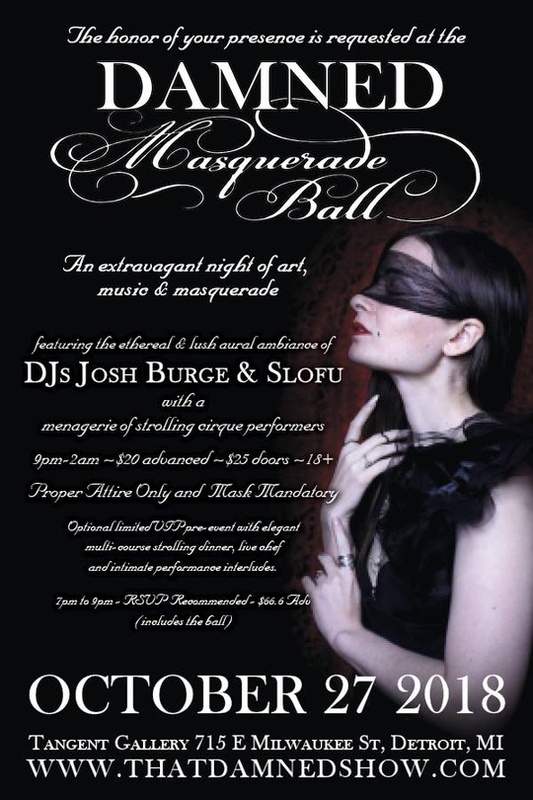 10/27 “The Masquerade“ – A festive celebration through a menagerie of exotic cirque, sensual rhythms and masquerade. This closing night features the formal mask-mandatory masquerade ball, an elegant 13-dish strolling dinner prepared by on-site chefs, Ginger Devil whiskey sampling courtesy of Rusted Crow Spirits, sensuous dance performance interludes, the dreamworld aural ambiance of DJs Josh Burge (Plastic Passion) and Slofu (Happy Endings) and a menagerie of strolling cirque performances all night. This night is mask mandatory and proper attire only. DAMNED, first and foremost, is an exhibition of the intensely personal creations that are often born from within the artist’s most darkest hours that often returns them towards the light. DAMNED then cultures an intriguing visual ambiance of art-inspired explorative performance vignettes with the region’s most creative talent. For 2017, the astounding performance roster includes Satori Circus, Detroit Circus, Jade Ashekerra, Shadowe Feuer, Jennabelle Feuer, Stella Isis Rothe and Rocky Raquel. Aurally, the haunting gallery soundtracks are custom designed by Life Toward Twilight with the mesmerizing live music ambiance of Dixon's Violin and Marcus Copernicus. Then on Saturday October 27th, DAMNED will transform the exhibition into a sensuous celebration of extravagant delicacies, libations and dance with a formal, mask-mandatory Masquerade Ball. With doors opening at 7pm for private viewing of the exhibition, this very intimate VIP engagement will include an elegant 13-dish strolling dinner with on-site chefs and sensuous dance performances interludes to further enhance the senses and inspire. Access to the lush and exotic VIP Lounge is included all night with complimentary snacks and refreshments. The public doors then open at 9pm with a special aerial performance by Detroit Circus at 9:30 amidst the art. Then from 10pm until 2am, the evening becomes enveloped with the dreamworld aural ambiance of DJs Josh Burge (Plastic Passion) and Slofu (Happy Endings) bringing a carefully selected mix of ethereal dreampop, lush trip hop and smooth grooves all blended with alternative classics for a night that will delight your aural senses. All within a menagerie of exotic cirque performances throughout the venue. Tickets are now available online and at Noir Leather in Royal Oak and River's Edge Gallery in Wyandotte starting at $15. 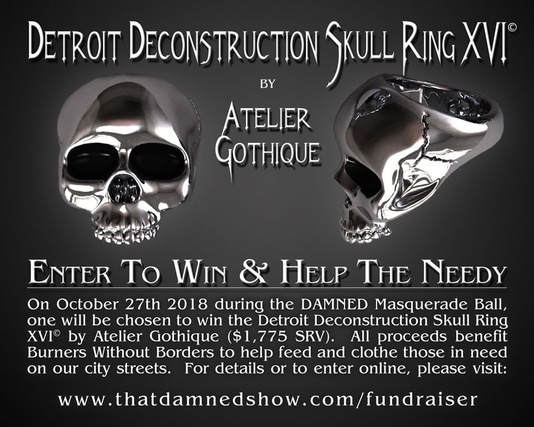 HELP US HELP DETROIT’S HOMELESS: At midnight Saturday October 27th 2018 within the formal masquerade ball of the DAMNED Exhibition, a single raffle winner will be chosen to win a uniquely exquisite prize: The new Detroit Deconstruction Skull Ring XVI© created by avant-garde fine alternative jeweler Atelier Gothique. All proceeds from the raffle will go to benefit our favorite charity, Burners Without Borders, to help feed and clothe those in need on our city streets through the hand packing and one-on-one giving of survival backpacks. Each year, the raffle has raised up to $1500 that went directly to our favorite charity, Burners Without Borders Detroit, whose sole mission is to help feed and clothe those in need on our city streets through the hand packing and one-on-one giving of survival backpacks. These packs contain a variety of simple needs often taken for granted within our busy lives: toiletries, feminine products, underclothing, canned goods, water, plasticware, the back pack and more. BWB also collects hats, gloves, coats, and blankets during our colder months to coordinate volunteer drives to find and give to those sleeping in the streets. This is real-life grassroots community “giving” by volunteers in the true spirit of the word with no corporate management profiteering!